Some of the information below will depend on whether you are looking at the United States companies with warrants or the Canadian companies with warrants. The warrants will trade on either the NYSE or the Nasdaq and we provide you with all symbols and detail necessary for you to make an informed decision as to which warrants, if any, to purchase. Investors around the world with access to trading on the NYSE and Nasdaq will be able to purchase these trading warrants. Canadian investors will have no problem buying and selling the Canadian stock warrants and/or securities through their Canadian brokerage firms. For buying warrants on the Canadian companies, we provide in our Canadian database the U.S. symbols for the warrants, if any, and also the CUSIP number, if available, for each warrant. Please see my write up included in our Warrant FAQ’s, ‘Will My Brokerage Firm Buy The Warrants’. Most of the warrants trading today on the commodity and natural resource shares are on Canadian companies and thus it is necessary to have a basic knowledge of the benefits and limitations thereon. An original issue of Canadian securities cannot be sold in the United States unless they are registered with the Securities and Exchange Commission. This means that an American cannot buy Canadian securities when they are newly issued. He can buy them after they are issued and are traded, but he cannot buy the new issue that contained the warrants (unless they are registered with the SEC). Secondly, a United States citizen cannot exercise the Canadian warrant. If he exercised the warrant, he would receive a newly issued share and unless those shares have been registered with the SEC he cannot legally purchase them. Again, not a problem, as we personally see no reason for an individual investor to ever exercise a warrant. Warrants trade exactly like the underlying common stock and they are assigned a symbol for trading. As most of the warrants are on Canadian companies, you will have find it very easy to execute your orders with the Canadian symbol which we furnish in our database. Approximately 50% of the warrants in our database have an assigned OTC symbol. For all of the warrants, we provide the CUSIP number (the legal identification for each security)in our database which eliminates any issues from your brokerage firm as to the correct symbol for them to use for a specific warrant to place your order. We personally see no reason for an individual investor to ever exercise a warrant. 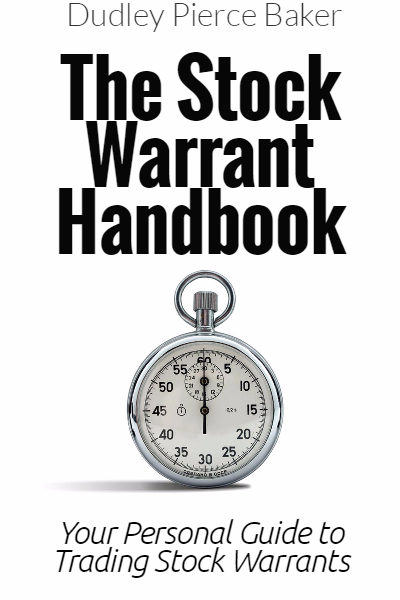 When the warrant has met your financial objective, you just sell the warrant as you would the common stock. You can sell the warrants anytime you want and do not have to hold to the expiration date (as a few investors erroneously believe). Many of the shares of the Canadian companies have not been registered in the United States. The same goes for the warrants other than a few which are trading on the U.S. exchanges. This is important to understand in that U.S. investors can generally not exercise the warrants as they are not registered in the United States. Please note the difference; United States investors can purchase the warrants but are generally not allowed to exercise them. Not a problem. Remember, our belief and rule is that it is never advisable for investors to exercise the warrants anyway, whether you are a Canadian citizen, U.S. citizen, etc. You just sell them when your investment target has been reached. This is very important, so read carefully. If your warrants are “in the money”, i.e. the common stock is trading above the exercise price of the warrants and the warrants are approaching the expiration date you must take some action. Unlike, call options, which if “in the money” and the options expire, the value of the option is placed automatically into your brokerage account, right? With warrants, this is not the case!! You must sell your position before the expiration date, or you will receive nothing. Also, if you hold warrants in a company and the company makes an offer for the warrants, via an early buy back, you must, must, must do something. The message here is to be alert as to the news, events and approaching expiration date of any warrants which you hold. Unless a company has a specific early call feature there would be no limitation on when you can sell up to the expiration date. Included in our Warrant Database we have a links to all of the relevant information you will need to make an informed decision as to which warrant, if any, to purchase. Our proprietary Leverage Calculations provide you with the current valuation of each warrant trading as to its, Fair Value, Over Value or Under Valuation. Warrants, like many of the smaller Canadian mining stocks, may have very thin markets and a big spread between the bid and ask prices. We always recommend you place only LIMIT ORDERS when buying or selling the warrants or the Canadian mining stocks. What happens to warrants if the company is taken over or merges? The warrant holders are usually treated well in a takeover situation. Some recent examples, Yamana Gold bought out Desert Sun on a stock for stock exchange and the old Desert Sun warrants are now traded as Yamana Gold warrants with the same expiration date. Another example was the buyout of Bolivar Gold was for cash and the warrants holders were treated well, even thought some of the warrants were still ‘out of the money’. Recent history is teaching us that when a merger is announced and the company being acquired is consenting to the deal and the terms are a stock exchange as opposed to a cash buyout that investors should best sell their warrants at the prevailing market price. Our rationale is that if management has consented to the deal this will usually prevent any other suitors. Also, these deals take months to actually close and your investment dollars are basically dead money during this long process. In a stock exchange arrangement, the warrants will continue on as warrants of the acquiring company with the same expiration date and with the exercise terms adjusted to reflect the terms of the stock exchange in the merger.